I honestly thought I would make it through my entire life without seeing a production Stephen Sondheim’s musical version of The Frogs. However, last week a friend of mine from NYC was in Cleveland assisting the lighting designer on a production of the rarely produced show at Cain Park (where I interned, fittingly enough, the same summer the revised Frogs debuted on Broadway). The production is quite ably performed, with an outstanding chorus and pit that present the pleasant, though not-particularly inspired, score in the best possible light. Dan Folino is consistently entertaining (and occasionally, sincerely moving) with a Mitch-Hedburg-inspired take on Dionysus, playing the God of Wine and Theater as an underachiever who is so disappointed in modern writers’ ineffective response to world affairs that he is motivated to go to Hades in the hopes that retrieving George Bernard Shaw will inspire them to do better. The direction and design elements are elegant and creative. If I HAVE to sit through a production of The Frogs, Cain Park’s offering is as good as any and better than most. But it’s hard to not spend the script’s more tedious moments imagining the cast’s and creative team’s talents applied to a worthier project. The 1974 Yale swim team in their native habitat, playing frogs. 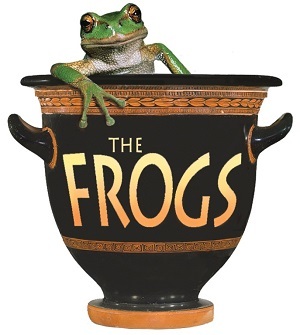 For 36 years, The Frogs was little more than an interesting bit of Sondheim lore: It was performed around a pool(!) at Yale(!) with an ensemble that included Meryl Streep and Sigourney Weaver(!). In Finishing the Hat, Sondheim describes his experience with the show as an unpleasant one (mostly do to the head producer at Yale) and dismisses the half-dozen songs he wrote for it as an academic “exercise: [a] chance to harangue an audience, to use a chorus a cappella to make sound effects, to write massed choral music, and to indulge in vulgarity, adolescent humor and moral judgement.” Though a bootleg was recorded during the Yale run, the score basically remained unheard and un-performed until a 2000 concert starring Nathan Lane as Dionysus, which led to a studio cast recording (also starring Lane) in 2001, revealing a score that is interesting for Sondheim completists but not particularly compelling otherwise. Nonetheless, Lane felt so strongly about the political resonance of the material that he adapted and starred in a 2004 Broadway adaptation. (The official book credits read: “a comedy written in 405 B.C. by Aristophanes. freely adapted by Burt Shevlove. even more Freely adapted by Nathan Lane.”) But aside from a protagonist who is vaguely unhappy with world affairs, and a few token topical references, the adaptation is more adept at skewering Ancient Greece and theatrical convention than modern politics. Sondheim did not particularly share Lane’s enthusiasm for the work, declining to comment on his new lyrics in Finishing the Hat other than to say that “they were written to suit the requests of the star and director”. His work mirrors this disinterest. 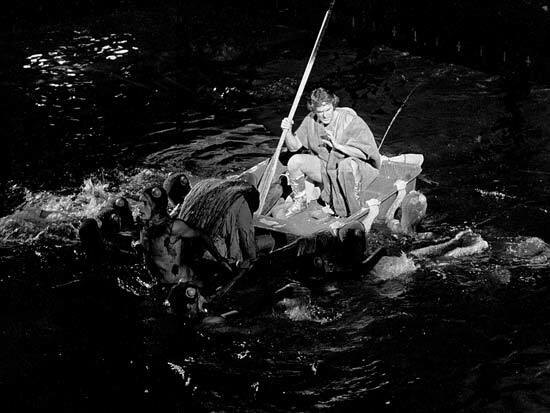 Whereas the original set of songs were mostly performed by the chorus, Lane’s version includs new songs for Heracles, Charon, and Pluto, a song extolling the virtues of Shaw (though I remain unconvinced that he was ever a likely candidate to save the 21st century through playwriting), and an attempt develop a back-story for Dyonisus in the form of a dead girlfriend. The result feels like a checklist of things that should make the show better (more timely political content? got it. increased sympathy for protagonist? check. Exposition about Shaw? nailed it! ), but ignores the fact the score isn’t all that interesting, the jokes aren’t all that funny, and the politics aren’t all that compelling. As Sondheim distills, “in Aristophanes’ and Burts’ hands, it had been an hour and a half long; it should have stayed that way”. It probably should have stayed at the pool as well.